Or more specifically the curse of Marvel Puzzle Quest. As most of you know (or don’t know because I doubt anyone other than spambots read this website). I write reviews of games during my leisure time. In fact I was working on Asura’s Wrath most recently and making some progress completing it (actually I finished the game I’m just trying to 100% it) when my friend gave me an old iPod touch. I never thought mobile games were anything I would get into but I got slammed hard first with Let’s Golf 3 then Marvel Puzzle Quest. The game is highly addictive. 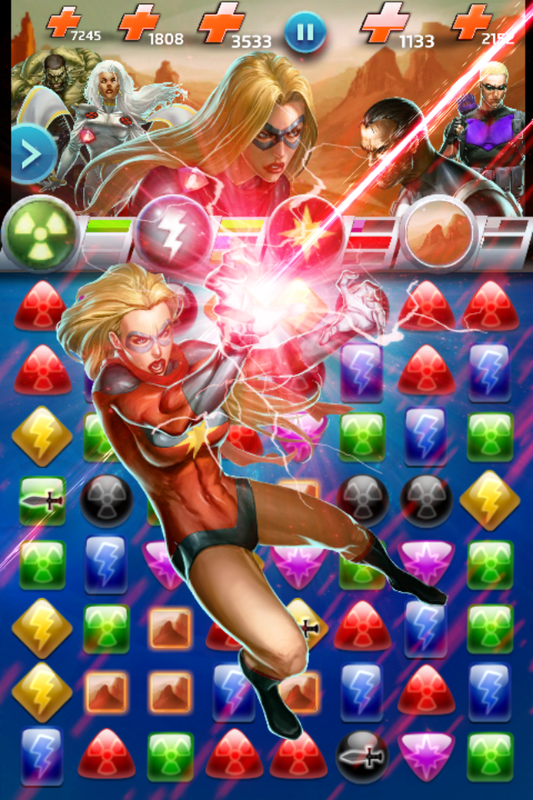 It’s a unique twist on Puzzle Quest (which is ho hum compared to this) using marvel heroes and villains with special powers that affect the gameplay. You collect comic covers that correspond to various characters and through these covers you can level up your characters improving their powers. The game is free to play but the catch is in order to keep the covers you need hero points. Hero points can be earned through playing the game single player and various tournaments but if you want a huge roster of characters the game forces your hand and you have to pay for hero points. I have never contributed to a free to play game until this game came along. I’ve probably spent over $30 on this game with no regrets. However, the game is brimming with content. It’s constantly updated with single player missions and tournaments springing up all the time. In fact most recently I participated in two tournaments and ended up with Psylocke and Magneto (classic). The only problem to get these characters you need to place well in the tournaments which last three days mostly. In the time that I’ve played these tournaments I’ve neglected friends and family, brushing off their requests so I could ensure good placements in these tournaments. I’ve had respectable top 20 finishes in both but I would like to apologize to my friends for ignoring you. I hope to make it up to you in the future.